Hanon for Ukulele from Uke of Carl is a 31 page ebook with 28 scales and challenges for soprano, concert and tenor ukulele. Carl has arranged some of Charles L Hanon’s piano exercises for ukulele and it’s a great way to learn. This is a great book for all levels from beginner to more advanced players. If you don’t know what Campanella is this is a great book to get you started. Jonathan Lewis’s free book teaches you what campanella means, techniques to help you play it and gives you some easy tunes to get started with. Samantha Muir’s free ebook features 20 exercises that work on your right hand development. It aims to help you improve your tone, control, fluency, rhythm and projection. Samantha has also created videos showing each of the exercises from the book. There can’t be many ukulele lists out there that don’t feature something by Al Wood from Ukulele Hunt. This list is no exception to that. Al’s free ebook is a great book if you’ve found yourself with a ukulele and you literally have no idea what to do with it. 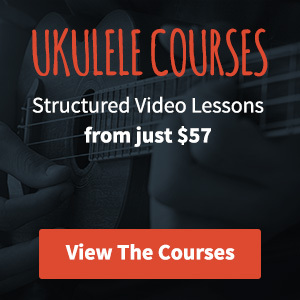 I’d highly recommend checking out Al’s other ebooks too if you’re serious about learning ukulele. Another book that’s great for the beginners out there. This book from Play Music Company looks at the anatomy of a ukulele, tuning, strumming, chords and even gives you a few songs to go at. Jeremy Messersmith’s free songbook features songs about cats, flying cars and a whole bunch of other crazy stuff. It’s a well put together songbook (I love the cover) that’s definitely worth a download. There you go, that list ought to keep you busy for a while. If you know of any others please let me know in the comments and I’ll add them to the list. Many thanks for sharing resources! Getting so many hits this month thanks to you. No problem Carl, glad it’s helping!